Or in person at Ivy’s Bookstore and Munro’s Bookstore. Order by phone at 1-800-838-3006 (Brown Paper Tickets). Caravan World Rhythms, is pleased to present the Itamar Erez Trio. 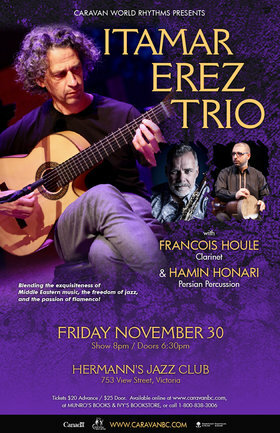 This ensemble features Itamar Erez on Guitar & Piano, Francois Houle on Clarinet and Hamin Honari on Persian hand percussion. These musicians recently debuted at the Vancouver International Jazz Festival and are continuing on their musical path and performing in Victoria, BC. The trio will be introducing exciting new material from Erez’s new album (to be released in 2019) as well as new arrangements of earlier pieces, blending the exquisiteness of Middle Eastern music, the freedom of jazz and the passion of flamenco! Itamar Erez, is a well-known Israeli-Canadian guitarist and pianist. His music is a unique blend of Jazz, Middle Eastern, and Classical music. Francois Houle has been described by the LA Times as “a spectacularly versatile clarinetist who appears to have no limitations stylistically or sonically is a master performer and composer of many styles of music.” He is one of Canada’s foremost clarinetists and has been working with Itamar to create new material which is suitable for this ensemble. Hamin Honari will be adding his unique style of Iranian percussion which goes beyond the traditional sounds of Persian music and blends beautifully in this intermingling of musical styles. Together, these three artists have developed a unique voice in both world and Improvised jazz music. Weaving together a complex array of sonorities, influences and styles, they turn their empathic playing into a kaleidoscopic, virtuosic, and infectiously uplifting music.